The Girl with a Clock for a Heart by Peter Swanson is a novel which tells of a mystery that spans several decades, mostly told in flashbacks. 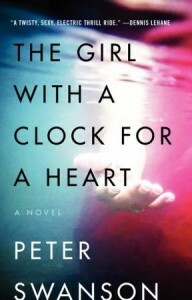 The Girl with a Clock for a Heart by Peter Swanson is an easy to read, fast mystery which consists of three timelines. The protagonist and antagonist meet in college, present-day when they meet again and flashbacks of what each one experienced. I enjoyed reading this book, the way the story unfolds is interesting and how the protagonist works through it from the past, to present-day, back to the past is skillfully written. I liked how the author managed to makes the reader think the answer to the question is just on the next page, and then he just pulls it from us to be out of reach again. There were two things which I found a bit annoying, the first is how dumb the protagonist is, he is 30 years old but still thinks like he’s 18. The second is the ending which I found abrupt and unsatisfying. This is a cautionary tale, a type of novel with a noire feel to it. This is an easy to read novel which is actually more of a thriller than a mystery. George Foss suddenly saw his college girlfriend, a woman who broke his heart, in a bar. Liana Dector is asking him to help her after all these years. Despite knowing full well that Liana is a liar, a con woman and a criminal, George cannot bring himself to say no and gets involved in her scams. I was more disappointed in this one than you were, I think. This is the kind of book where I think I’ll be able to stop reading at any time, but I always end up reading JUST ONE MORE PAGE. I love it!